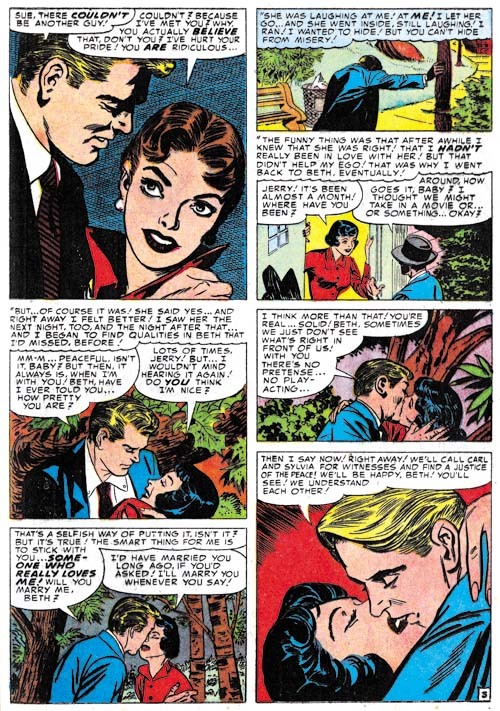 This final chapter of the serial post Little Shop of Horrors occupies the same time period as Chapter 27 and Chapter 28 of the Art of Romance. 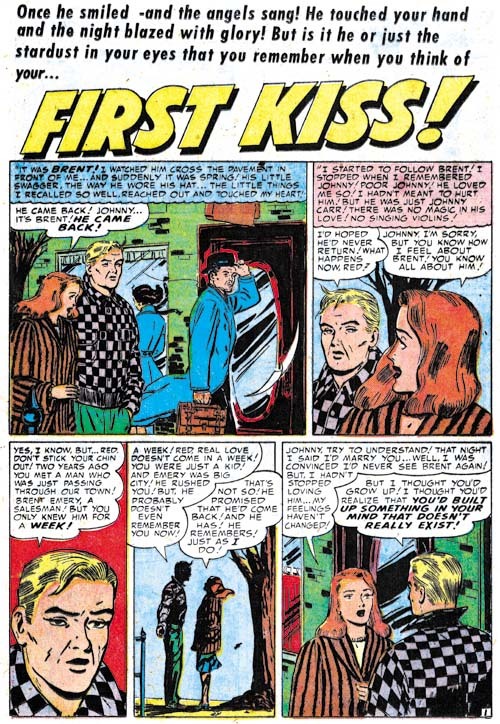 Black Magic mirrors, on a smaller scale, what happened at the same time in the Simon and Kirby romance titles. 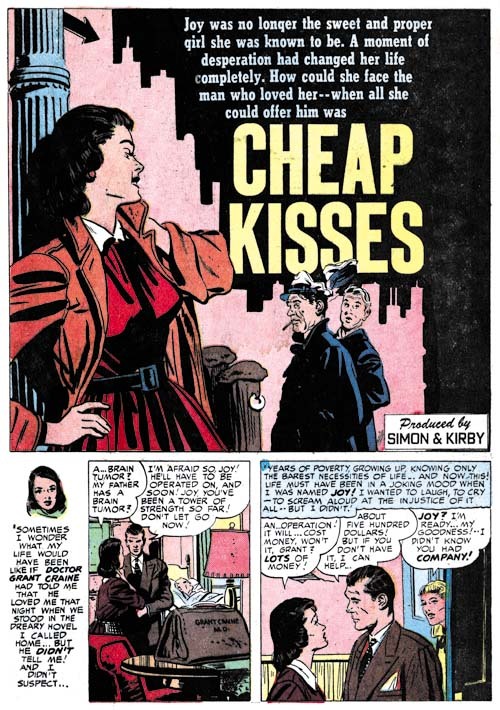 Basically there was an influx of art by artists new to Simon and Kirby productions. 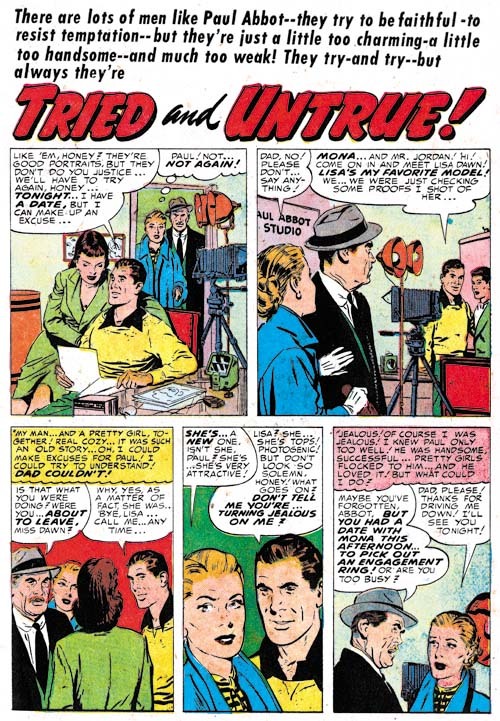 This can be shown by the fact that there were 58 pages by indentified artists and 45 pages by new unidentified artists. 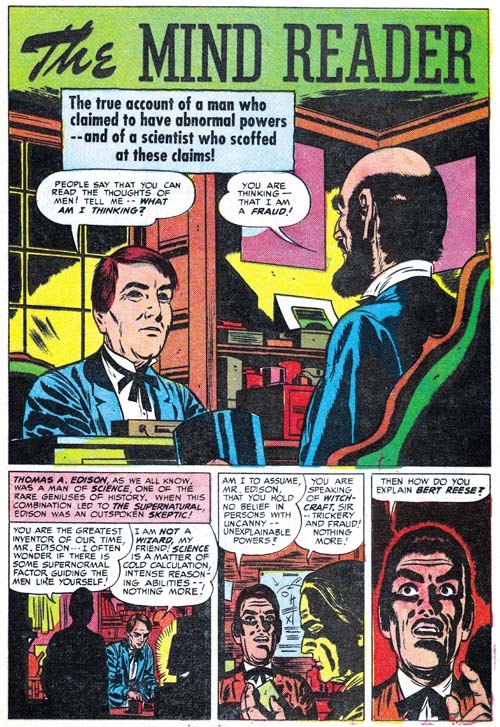 However there is one significant difference, so far I have not detected any Black Magic stories that looked like they were originally meant for another publisher. 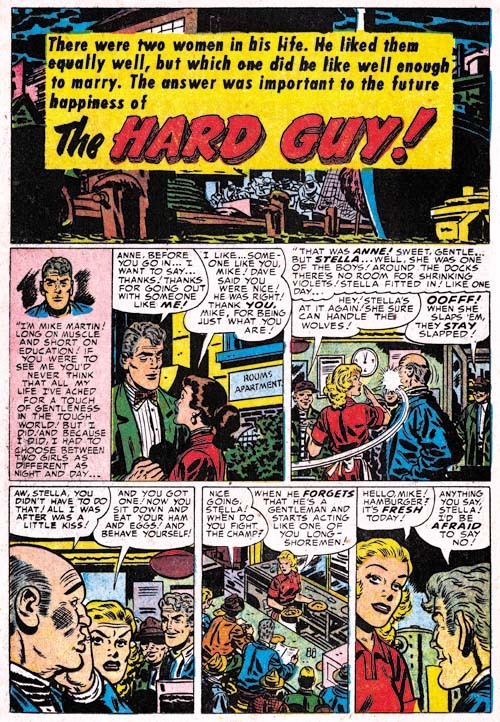 The four identified artists were Jack Kirby (33 pages), Mort Meskin (17 pages), Bill Draut (4 pages) and Al Eadeh (4 pages). 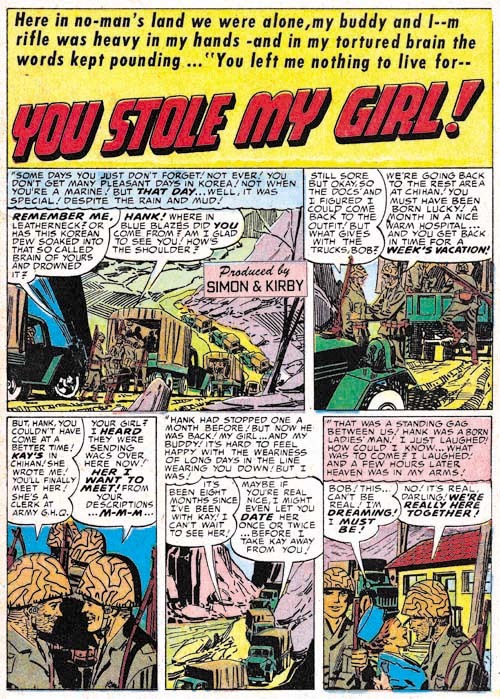 While during most of the Simon and Kirby collaboration it was typical for Kirby to be the most featured artist, during this period it was surprising indeed. 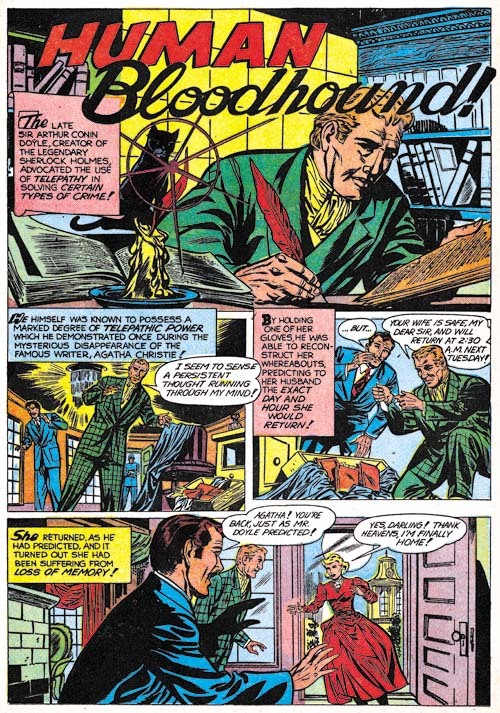 It was during this time that Joe and Jack setup their own publishing company, Mainline, and Jack’s contributions as a penciller plummeted. 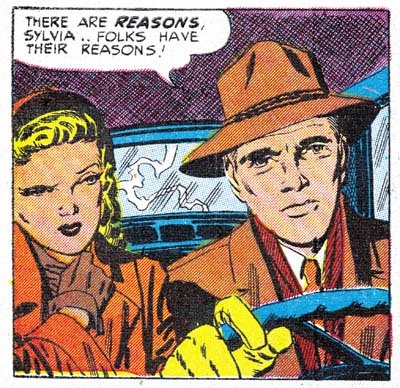 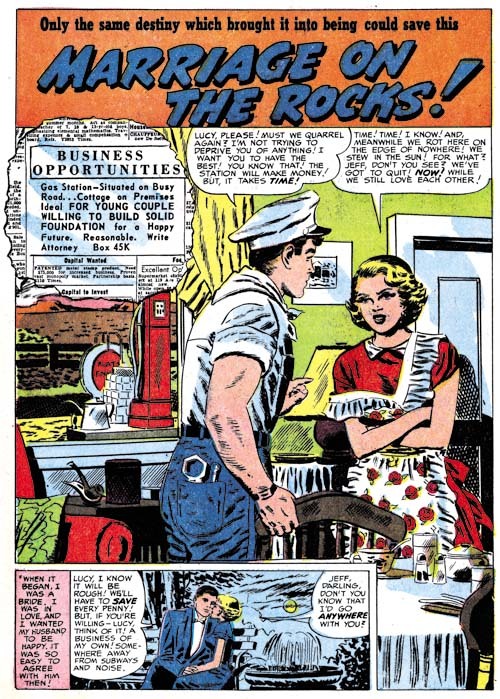 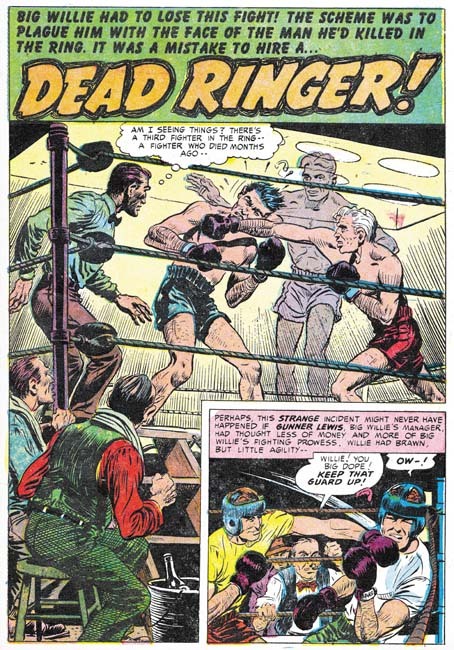 Jack drew relatively little for the romance, western, or crime genre all of which were produced by Simon and Kirby. 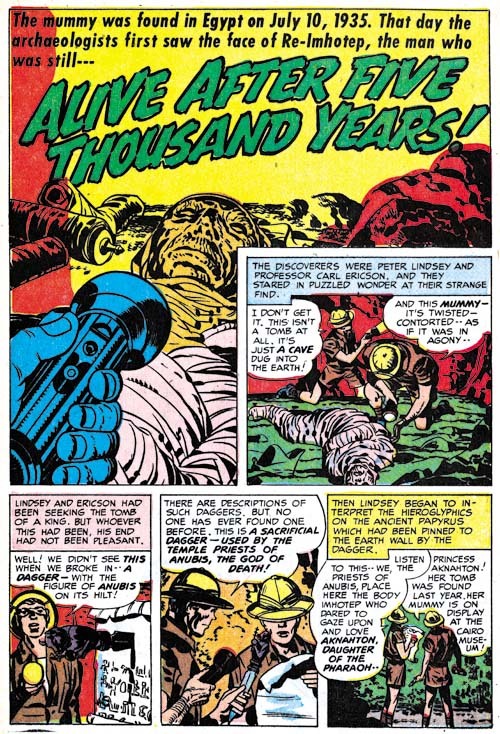 However at the same time Kirby was a consistent presence in superhero and horror. 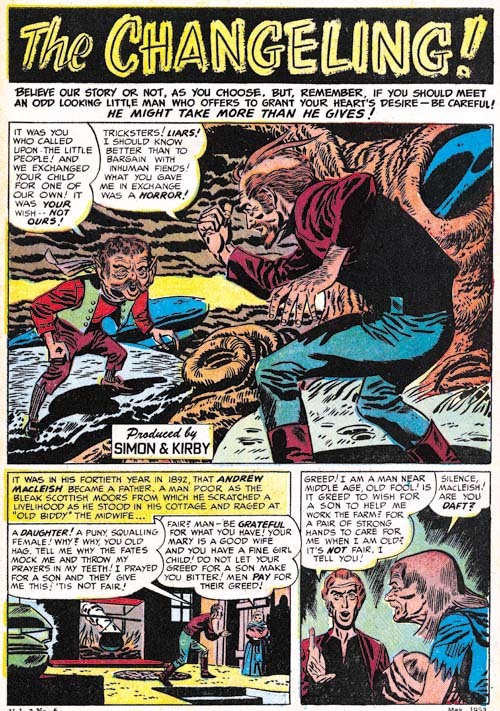 Mark Evanier has remarked that horror was not one of Kirby’s favorites but at least during this period that does not seem to be at all true. 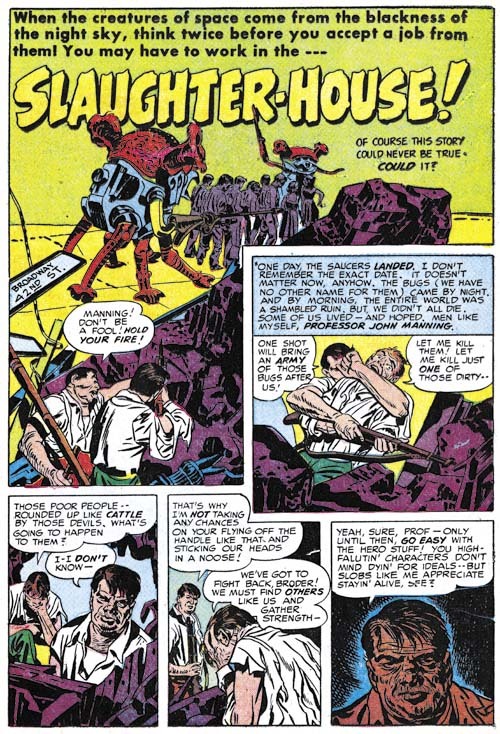 There were more science fiction stories toward the end of the Black Magic run. 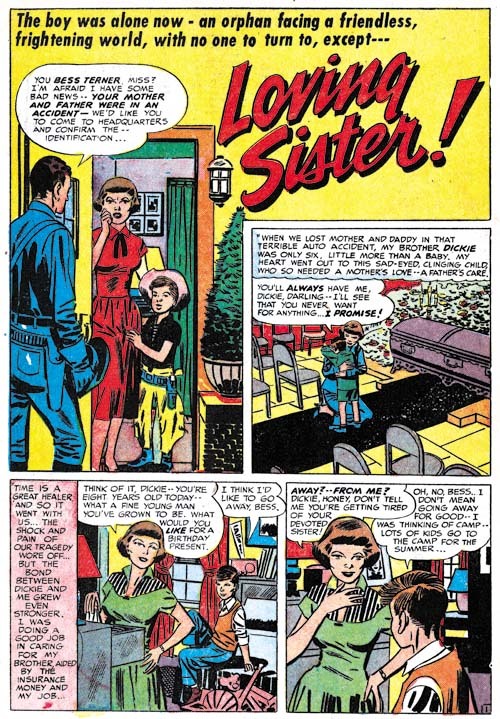 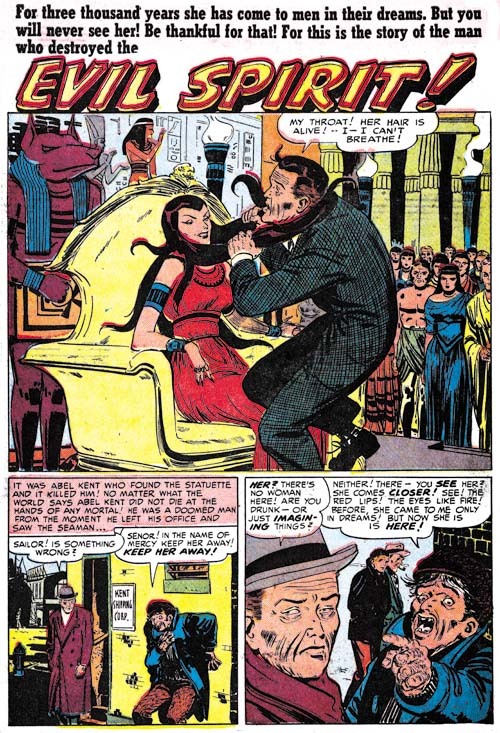 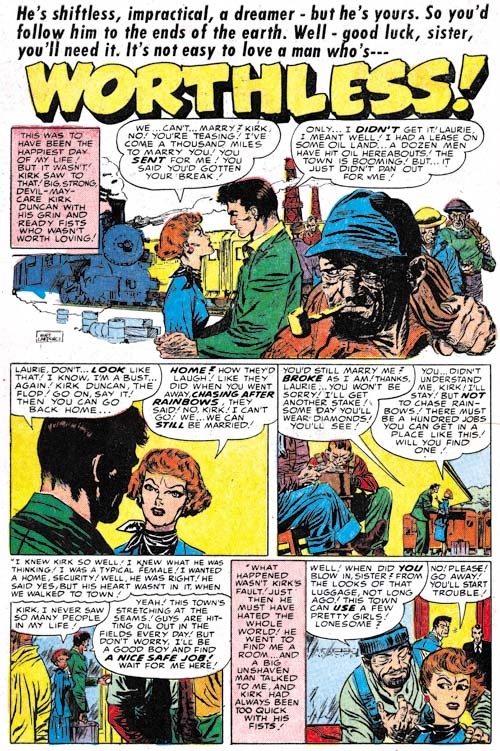 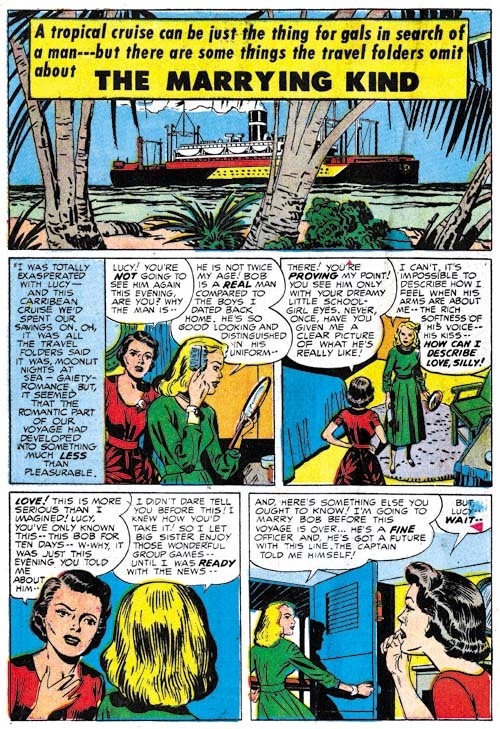 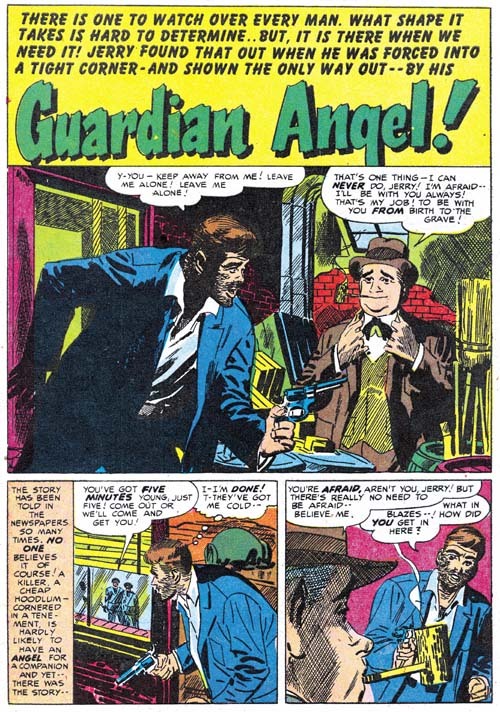 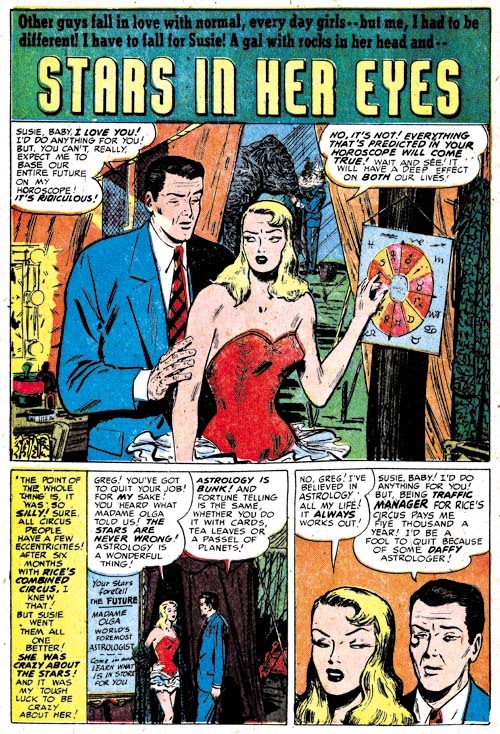 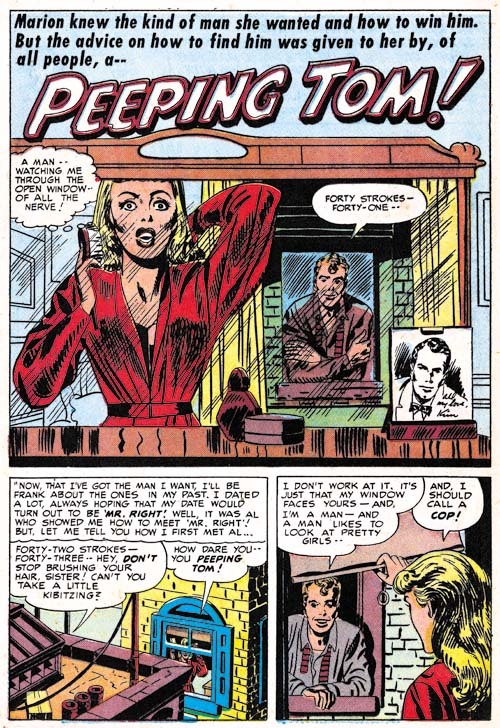 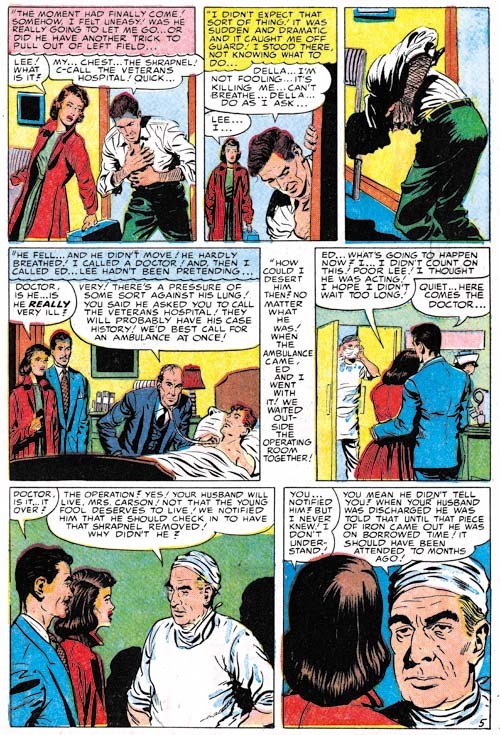 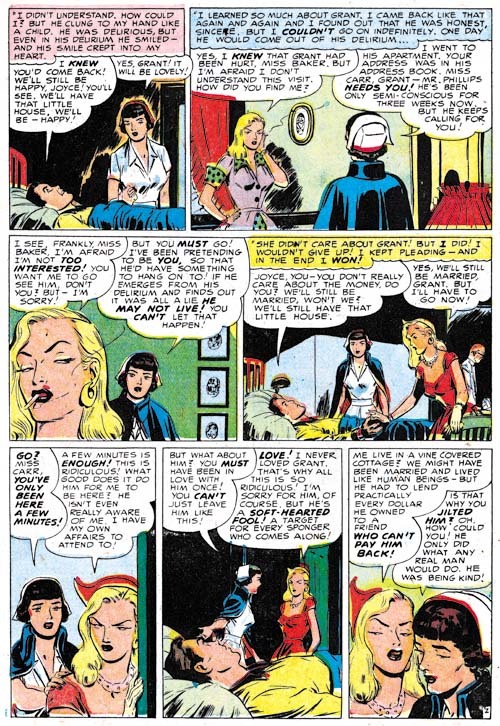 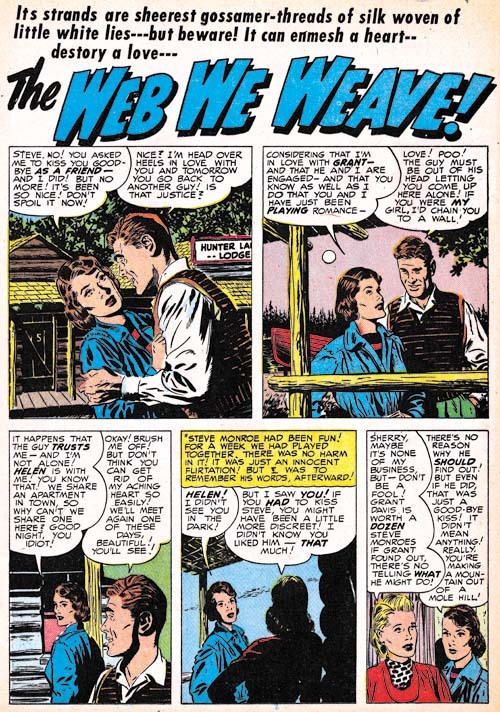 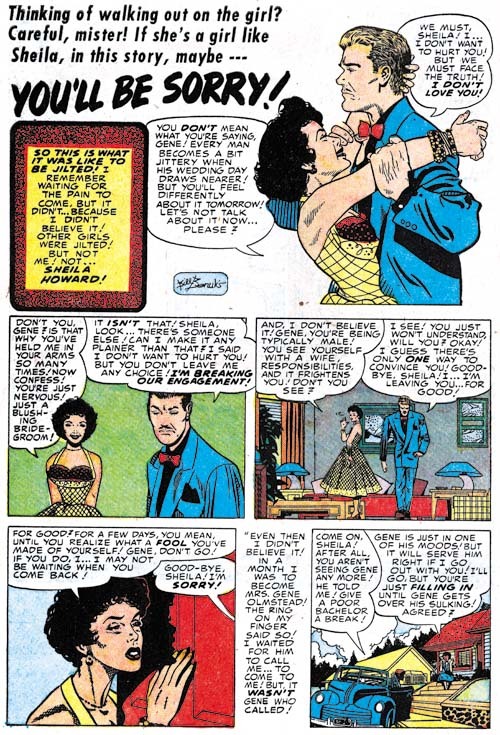 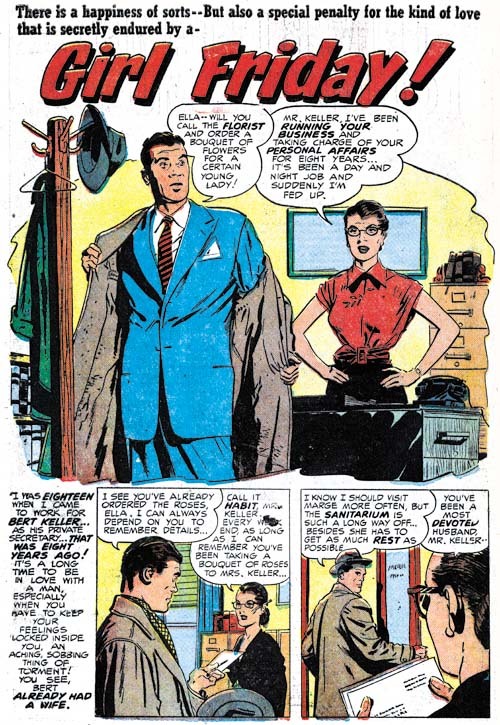 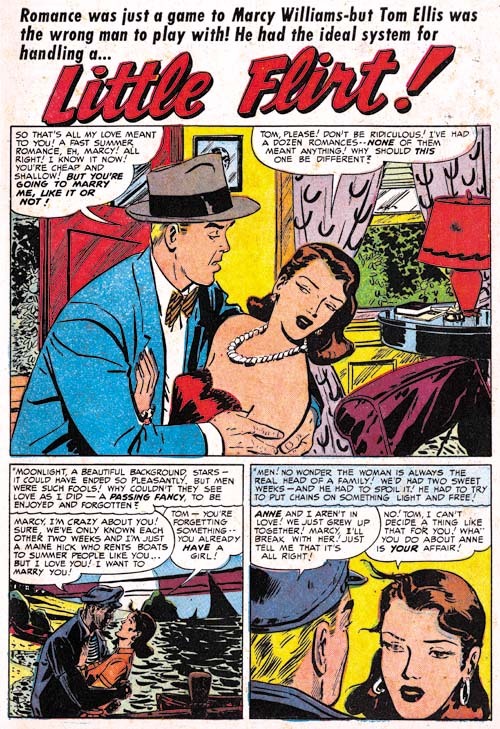 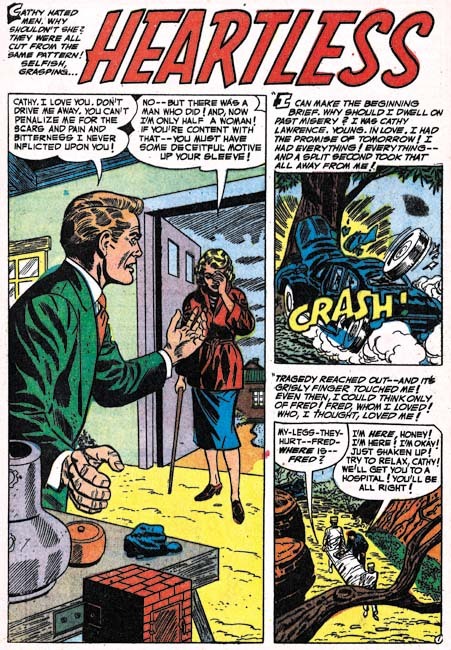 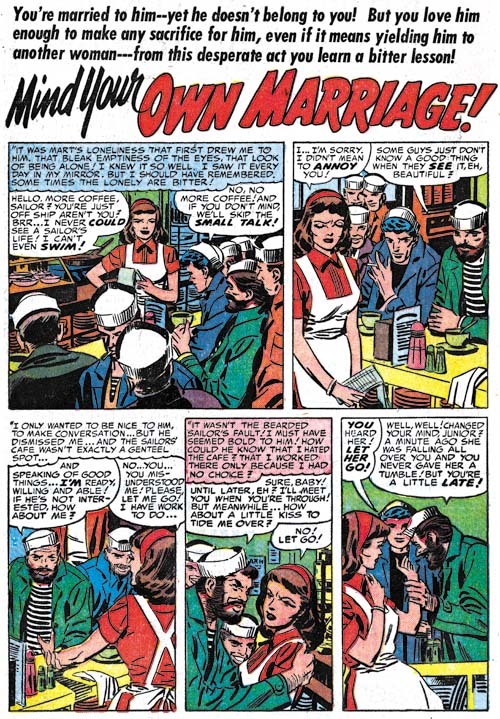 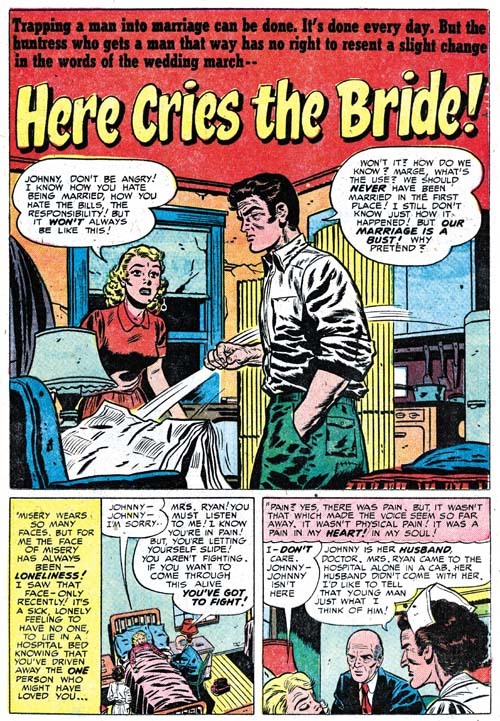 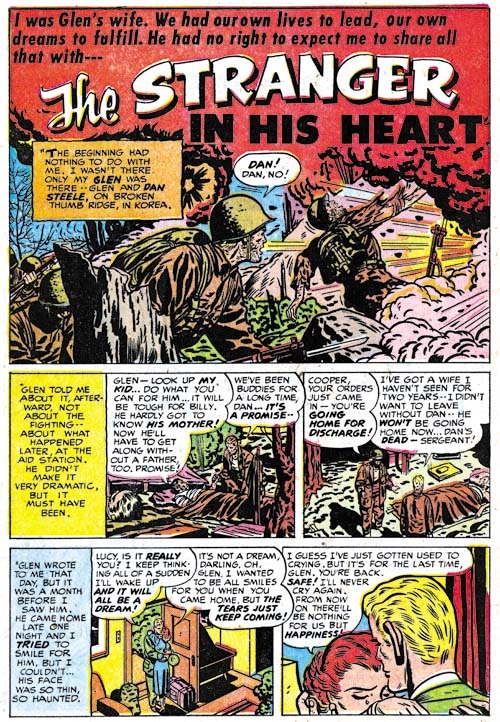 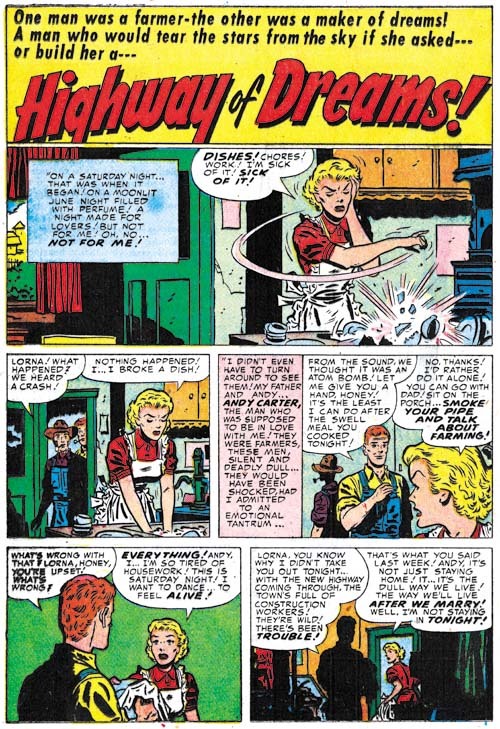 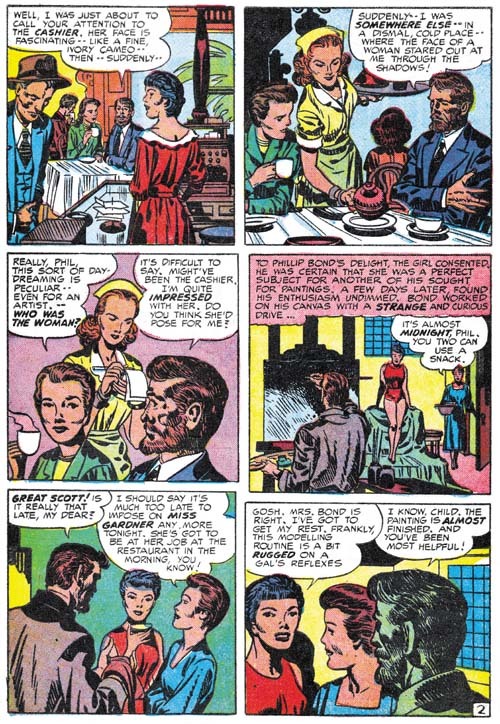 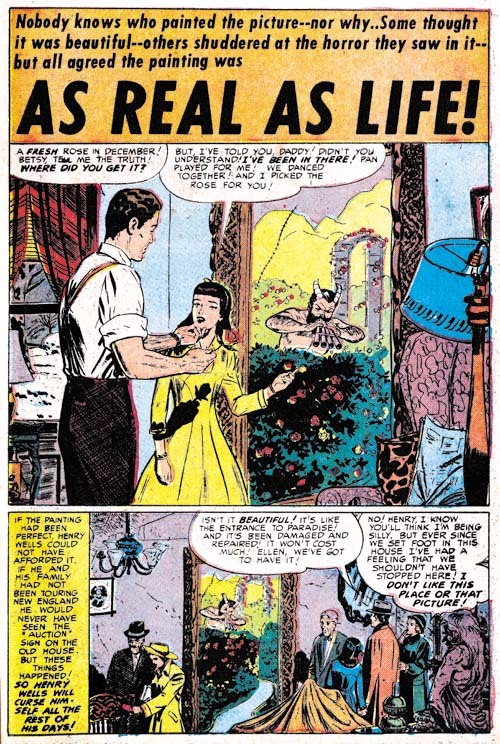 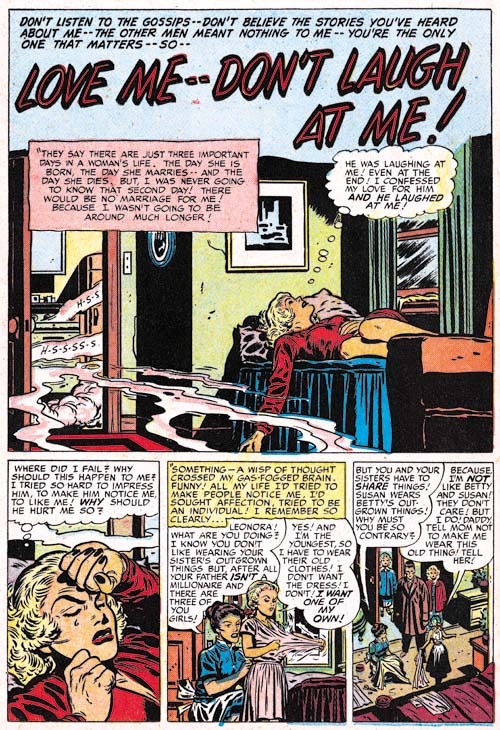 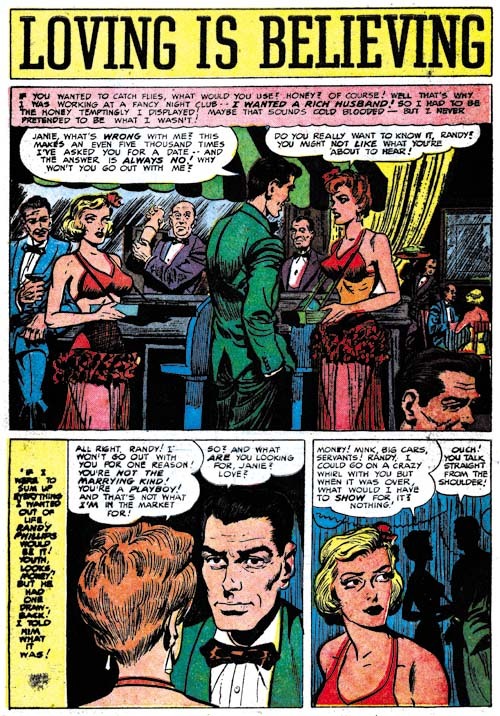 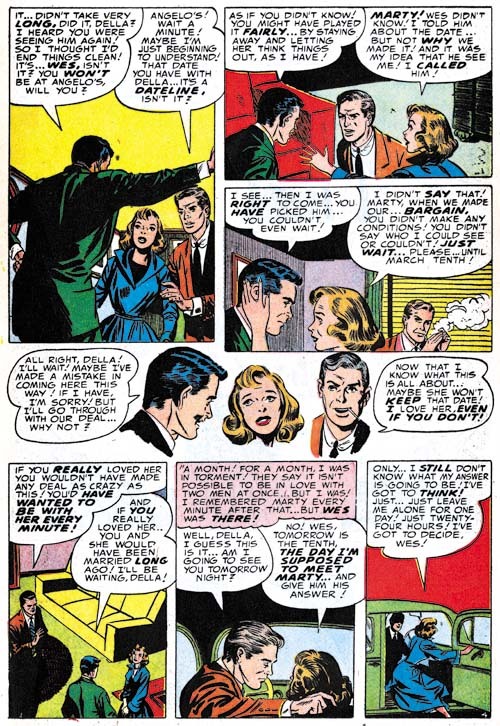 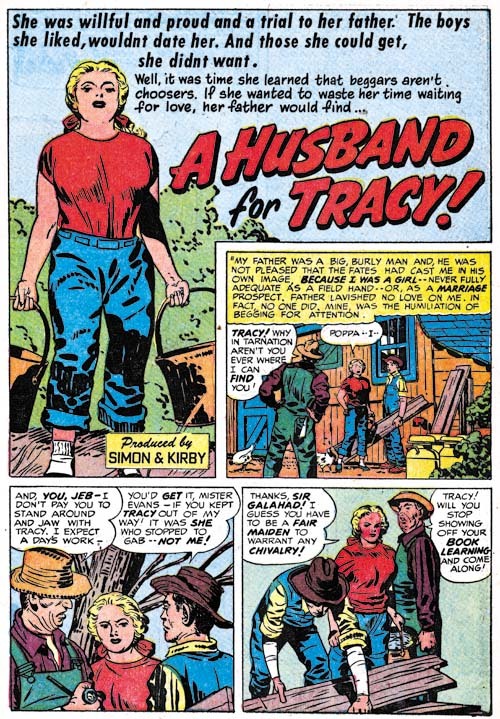 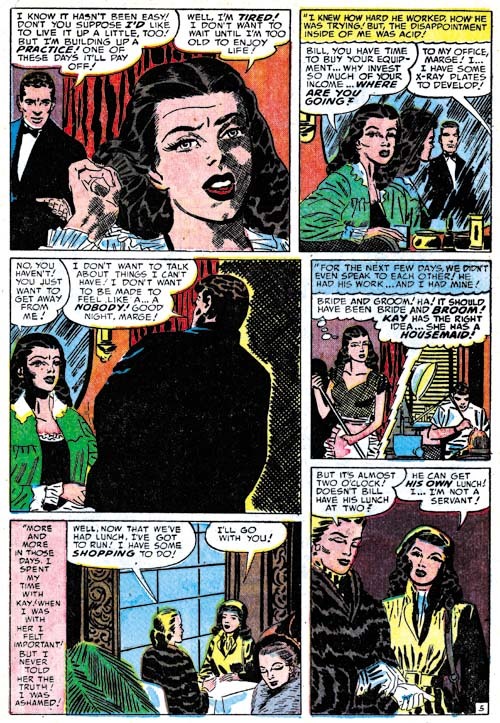 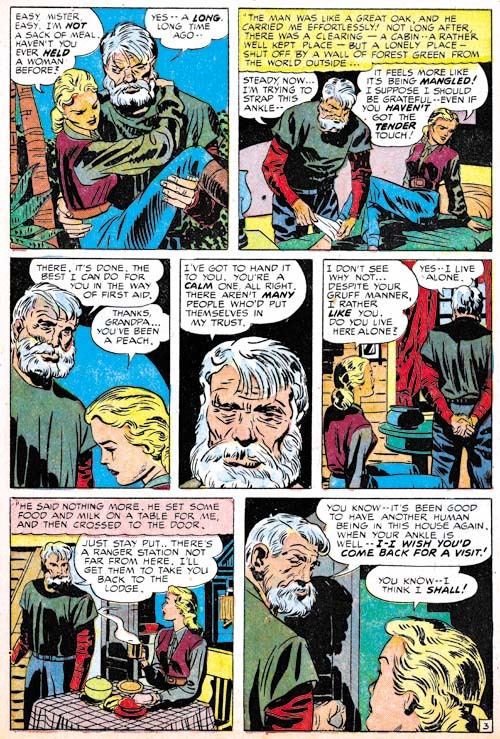 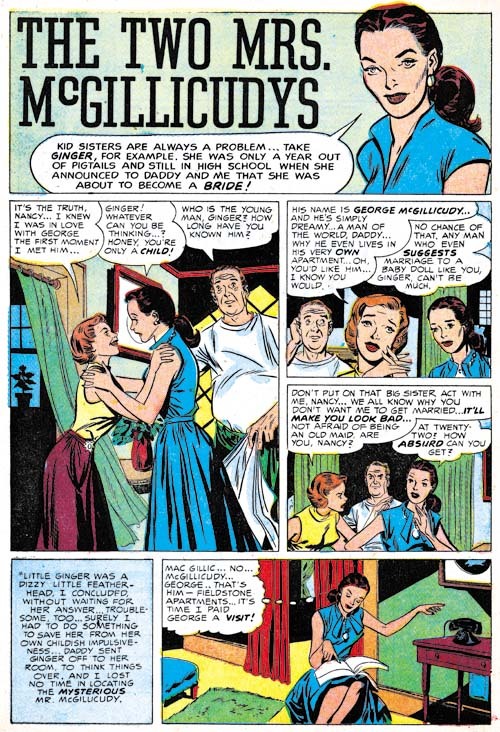 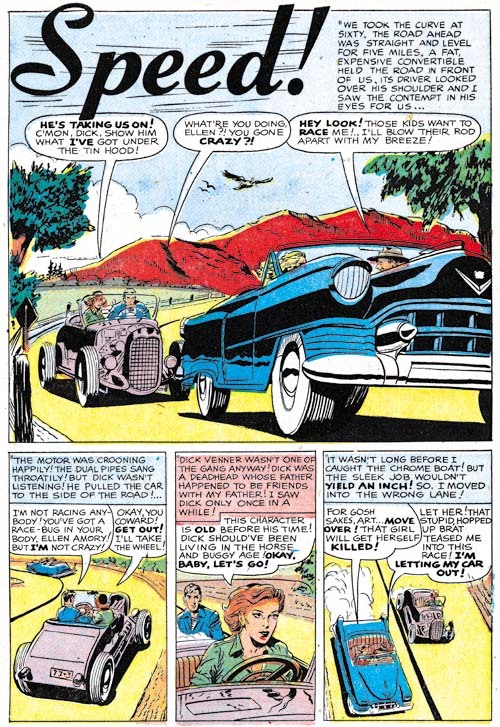 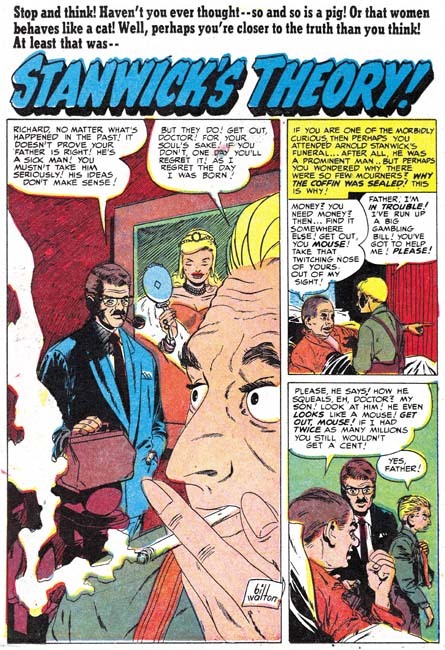 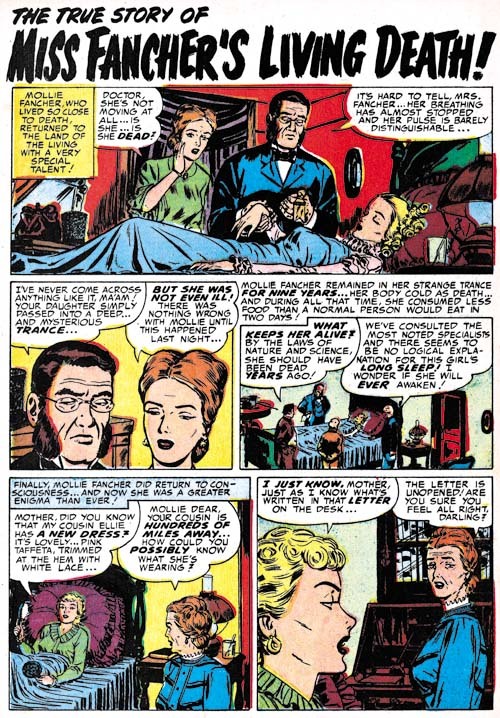 Kirby would often use such stories, as he did in some of the romance genre stories, as social commentary. 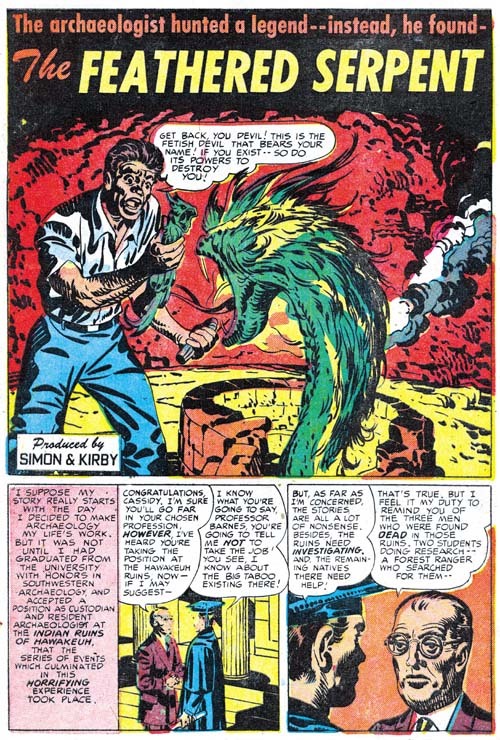 “Slaughter-House” may seem to be a classic monster story but it is not. 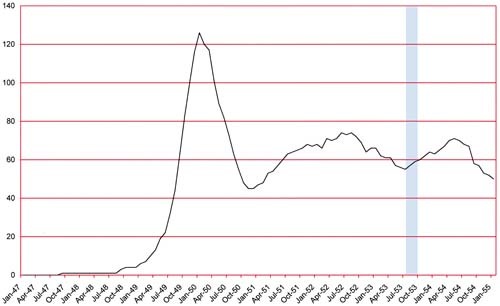 It is actually about the extremes people will take in order to try to survive in an impossible situation. 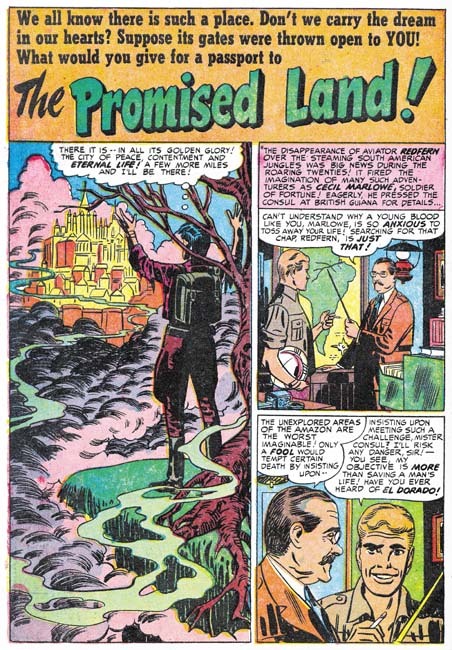 This story was greatly influenced by stories that came out of the Nazi death camps. 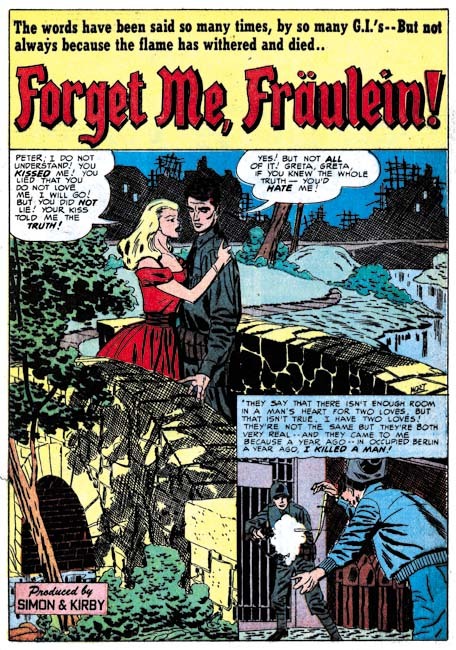 The Nazis might not have been bug-eyed monsters but their death camps forced desperate people to the extremes. 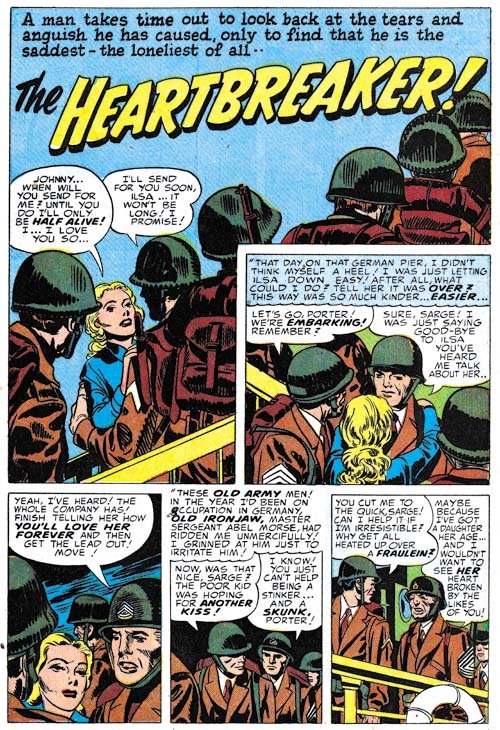 The splash panel is actually part of the story a technique that was commonly used in the period covered in the last chapter. 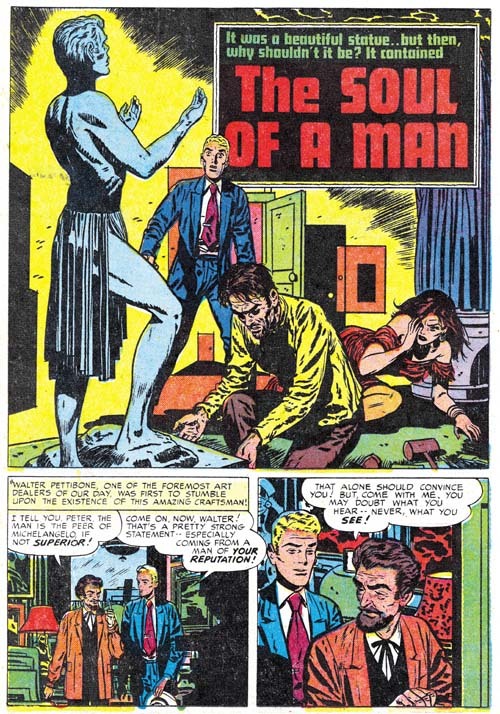 Another typical feature that this splash shares with those from previous issues was its smaller size. 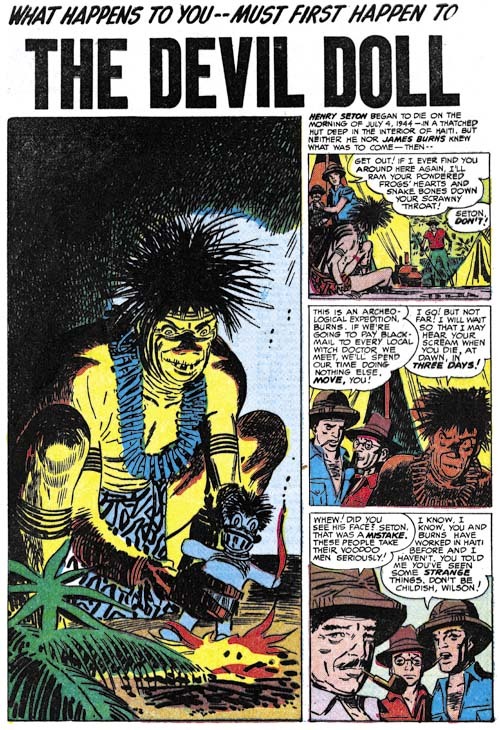 Larger more standard splash would return in the last issues of Black Magic. 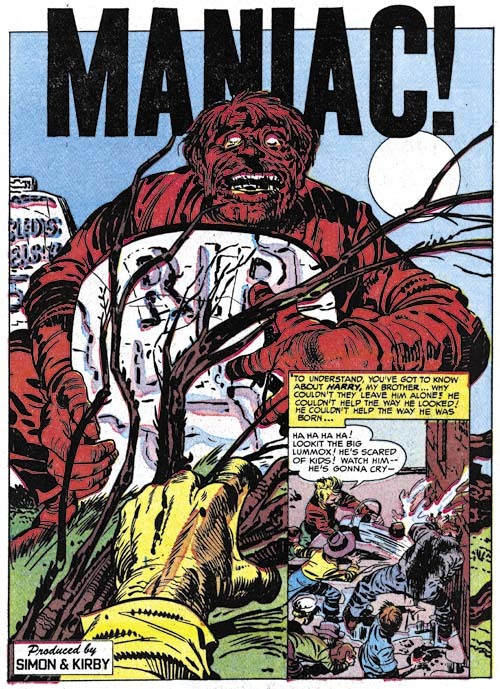 A more standard splash is found in “Maniac” but note the odd design where the title extends beyond the splash border. 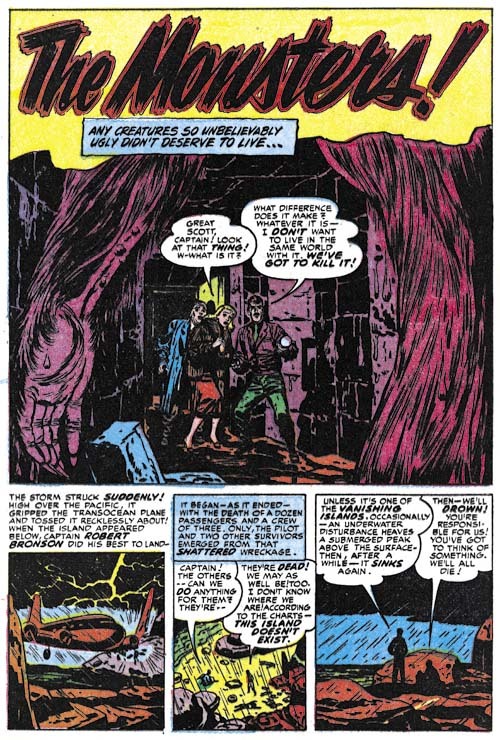 While keeping a large splash, Kirby has returned to using it as part of the story. 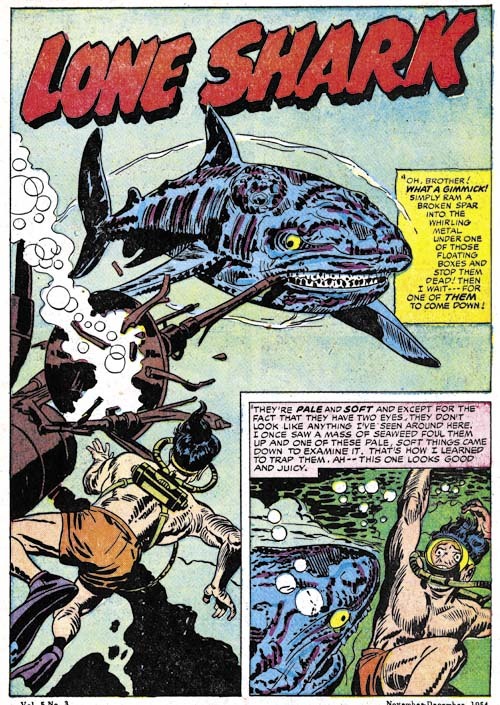 Jack did this so well that it is easy to assume this is a standard splash. 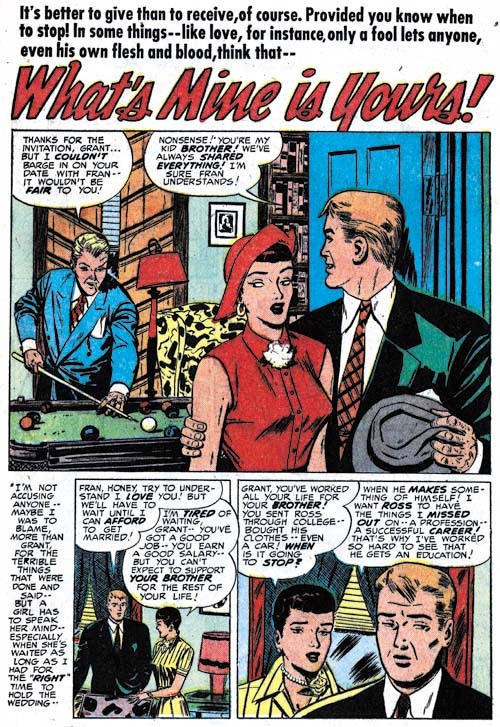 However the first story panel makes no sense without the splash. 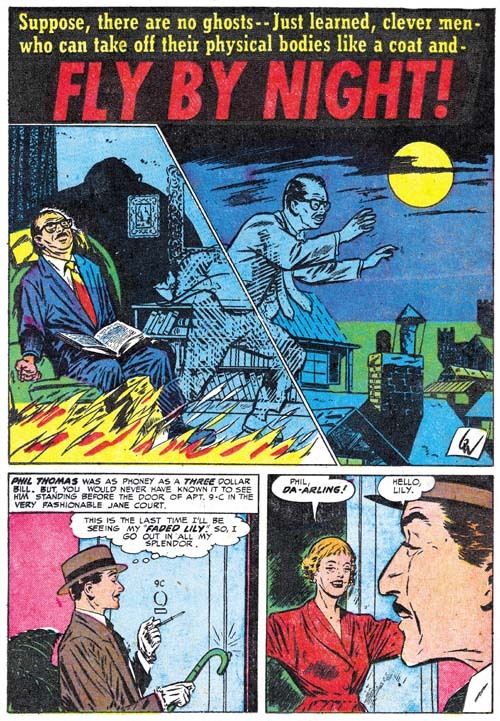 Mort Meskin seemed to have a particular interest in the horror genre. 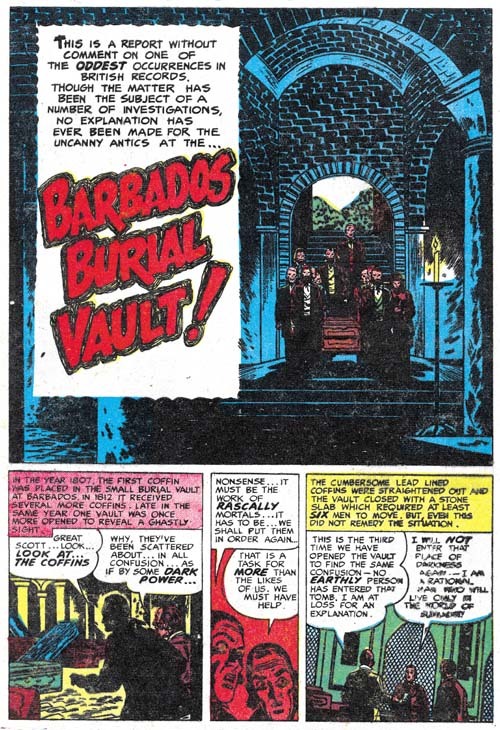 While I am a great admirer of his work, I find his attempts to depict gruesome things not all that successful. 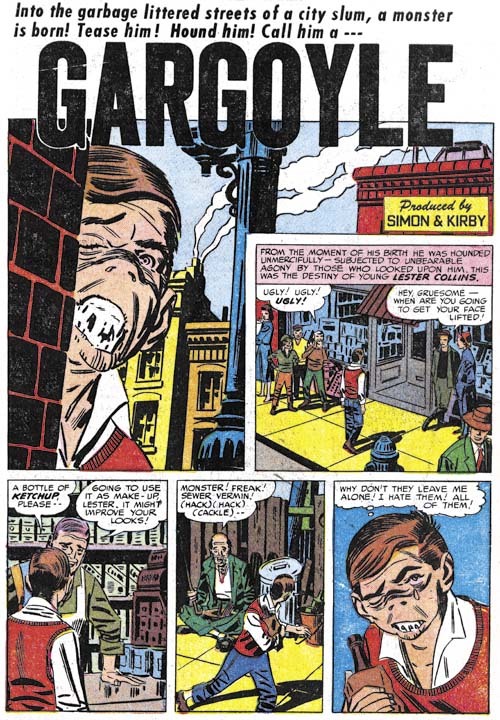 This might seem to be a fatal defect for a horror artist but Mort is so good at graphically telling a story that it really is not much of a problem. 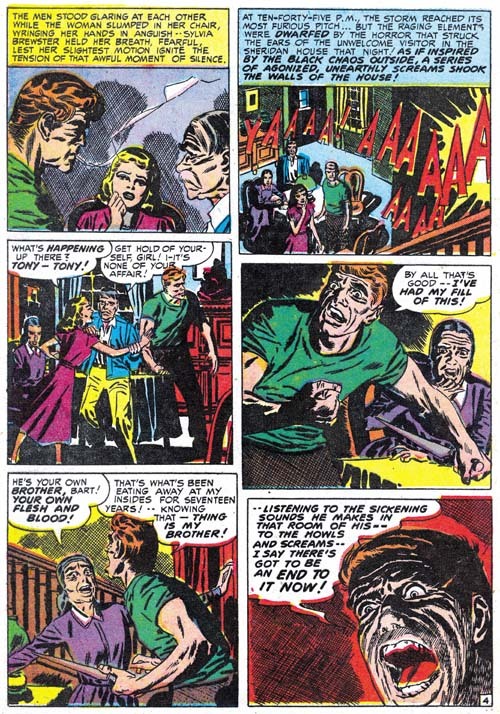 I have to wonder what Meskin’s drawing of the protagonist’s mouth is meant to represent. 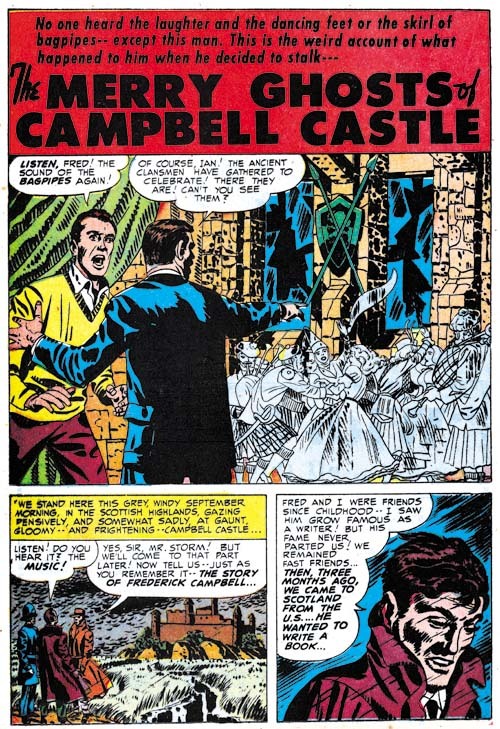 While I do not find the character in “Gargoyle” to be truly gruesome the witch doctor in “The Devil Doll” puts a chill down my spine. 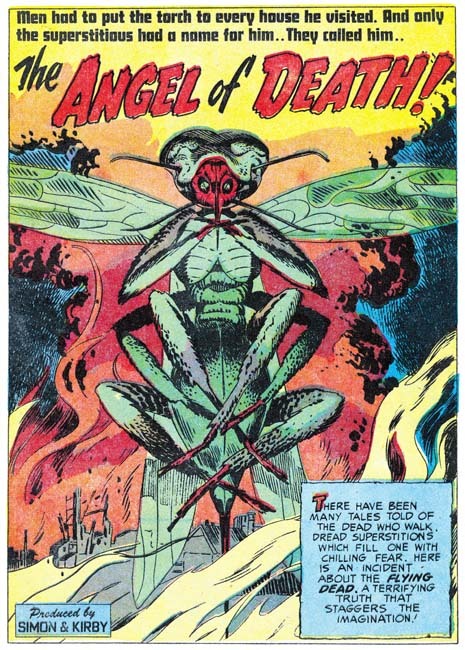 This has got to be one of his most successful efforts in drawing a truly disturbing character. 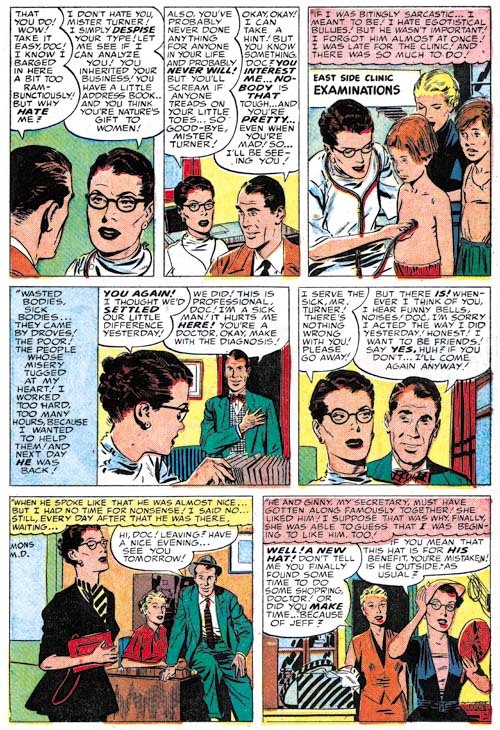 Bill Draut has not appeared very often in Black Magic in the more recent issues. 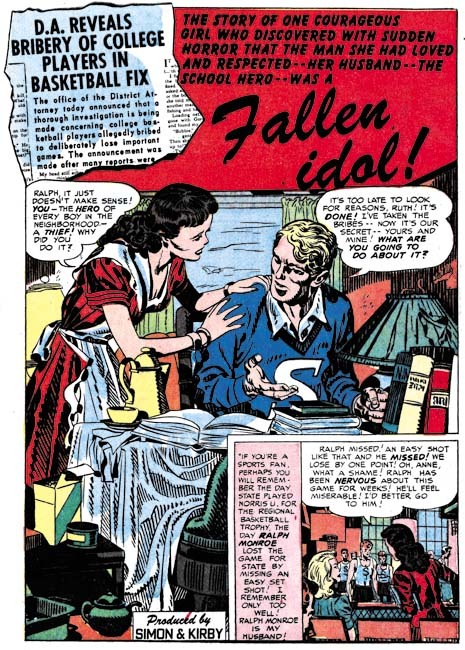 This must have been by design as Bill was playing an important roll in the romance comics at this same time. 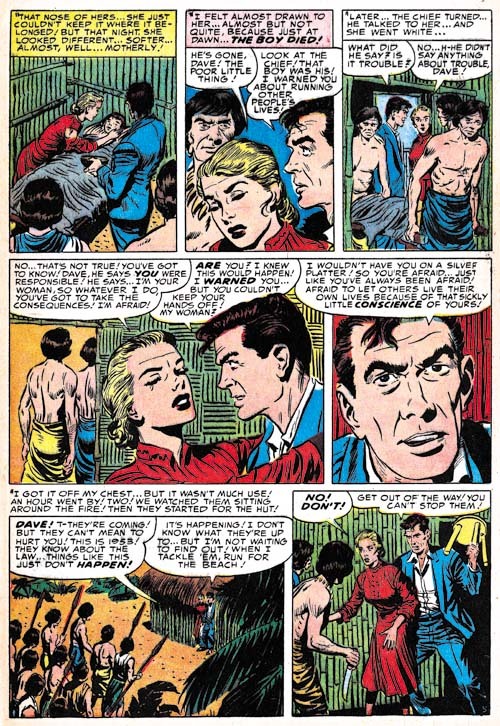 I admit that while I feel Draut does quite well in his horror stories his romance art is much more successful. 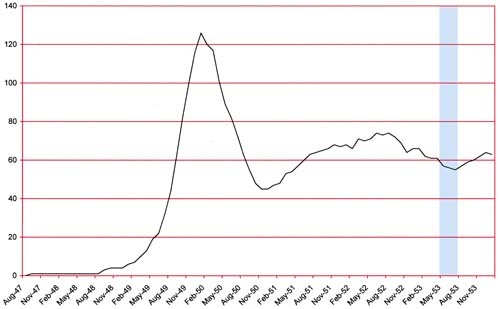 It is interesting how the art of Al Eadeh shows a slow but steady improvement over the years. 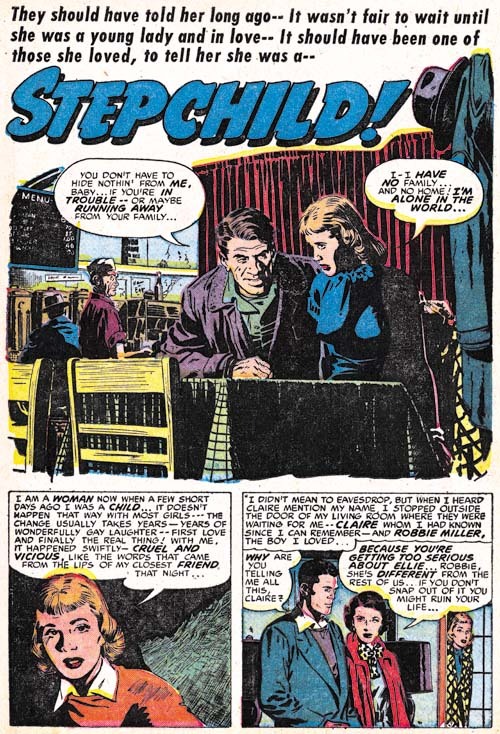 His earliest work for Simon and Kirby is rather stiff but that characteristic disappears in his later work. 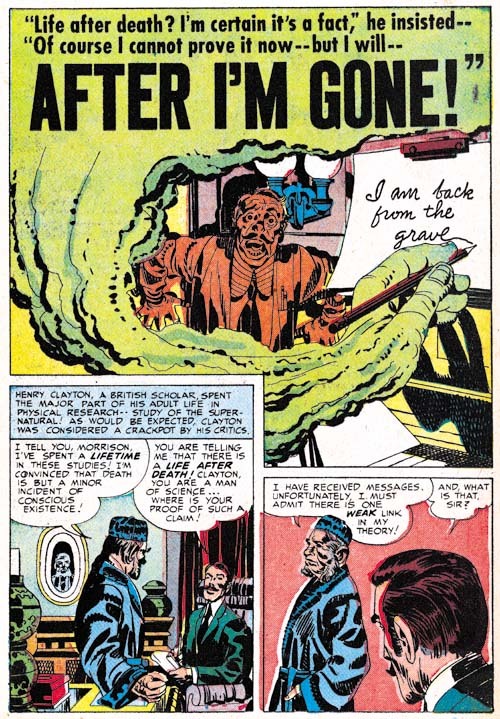 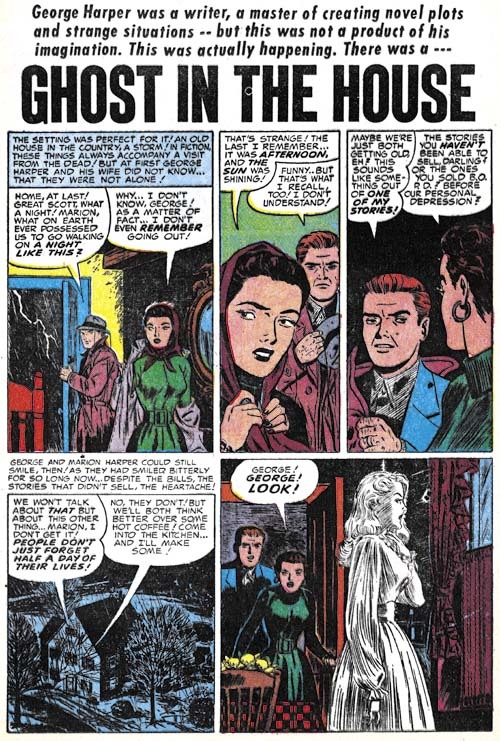 “Ghost in the House” is probable his most successful piece for Simon and Kirby. 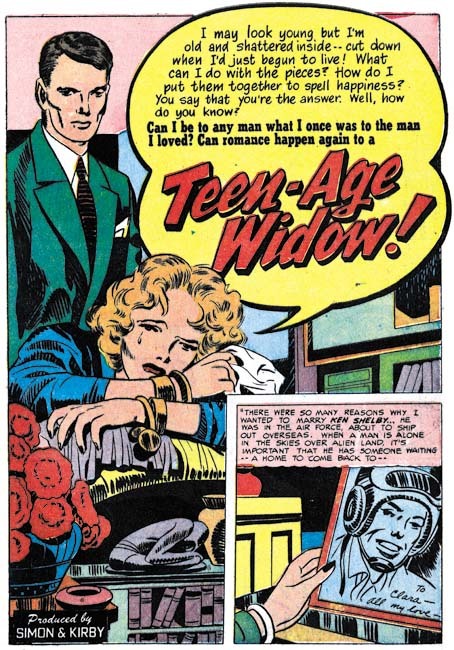 Unfortunately it is also seems to be his last for that team. 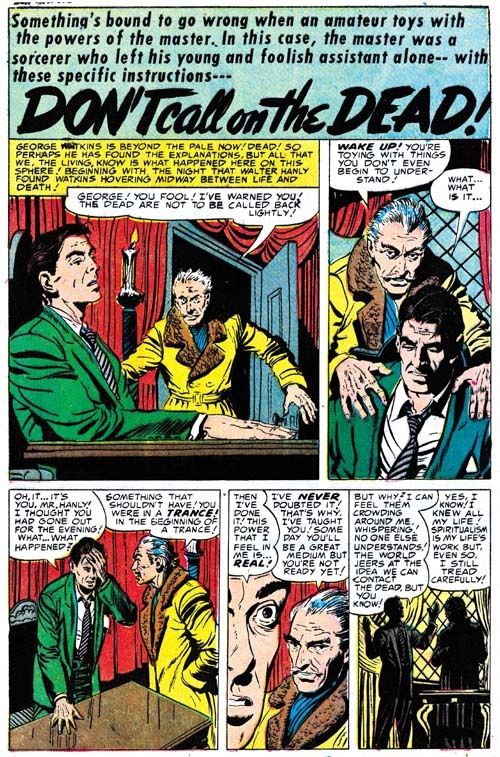 What a terrific splash is found in “The Devil, You Say?”. 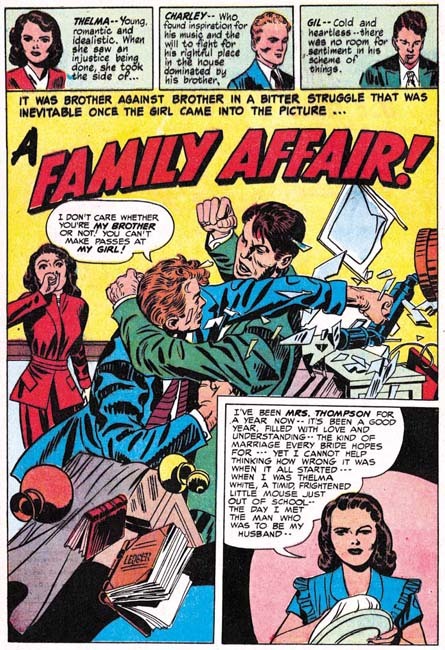 I cannot identify the artist and frankly the rest of the story art is not nearly as good. 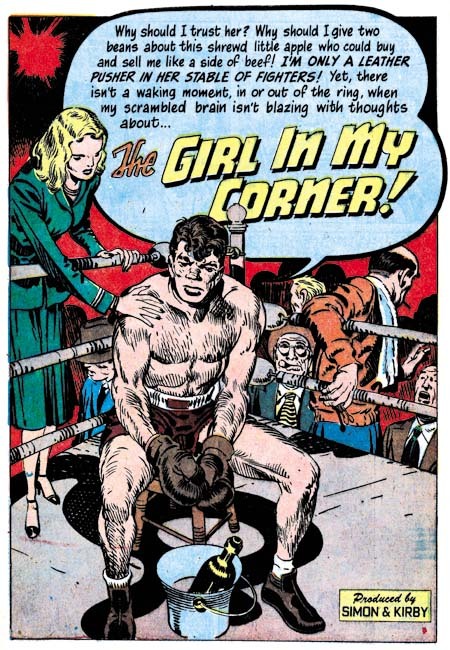 Another unidentified artist. 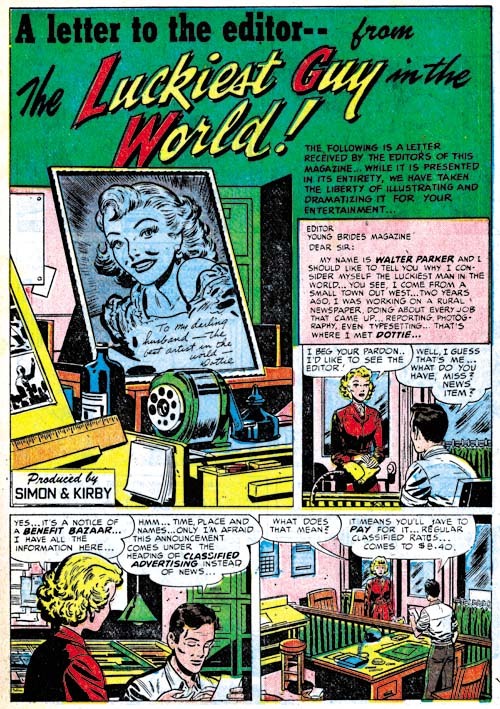 As I mentioned above, there seems to have been an influx of new artists in Simon and Kirby productions. 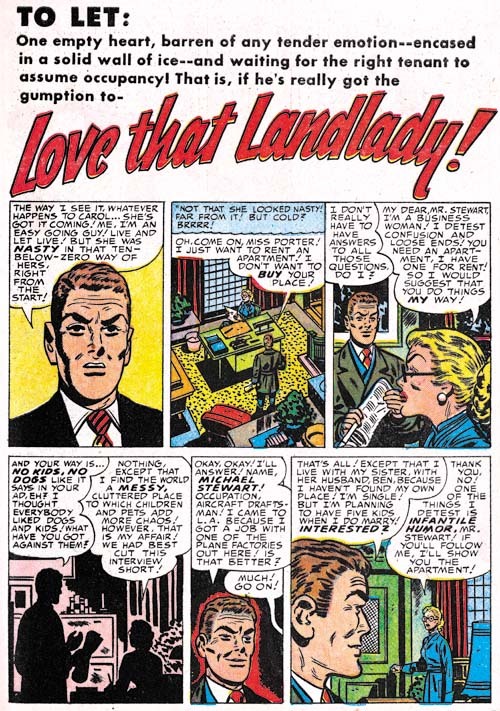 I cannot get very enthusiastic about most of them, but the artist who did “The Little People” was pretty good. 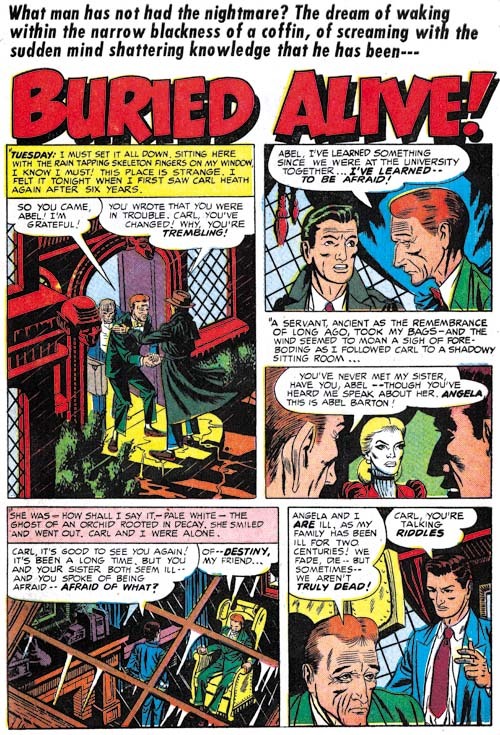 Issue #32 marked the end of the first run of Black Magic. 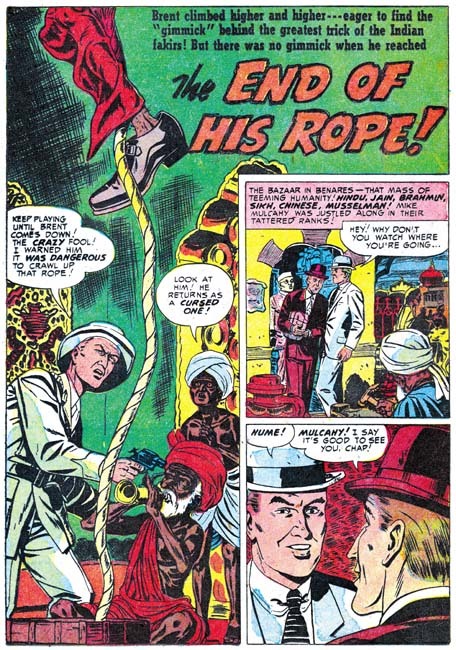 Initially Black Magic had been popular enough to warrant a monthly release schedule. 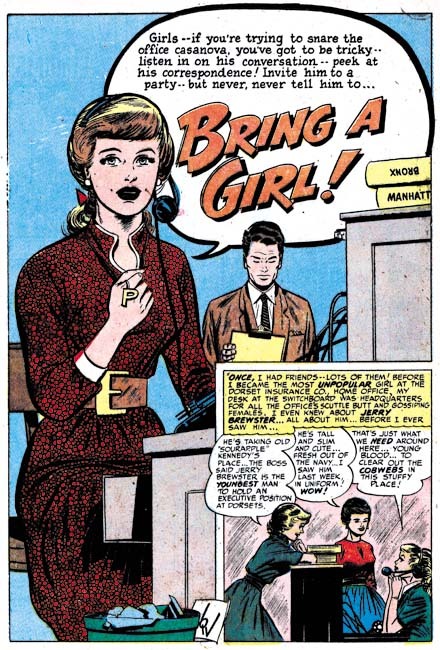 However for the last year it had been a bi-monthly schedule. 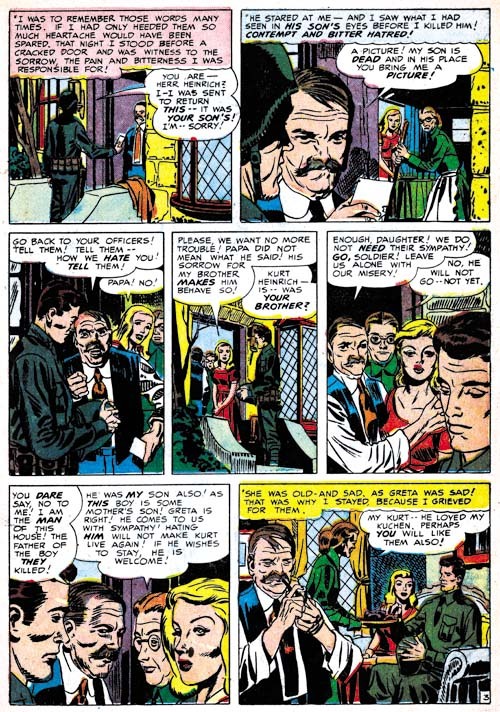 Certainly the quality of the stories or the artists that drew them had not changed so why had it become unpopular enough to discontinue? 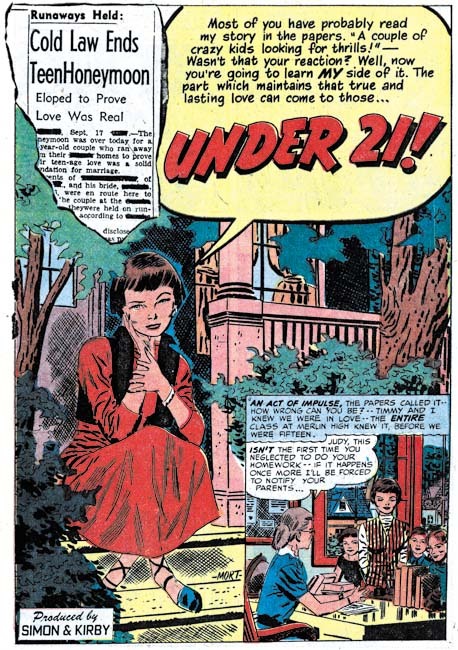 While I cannot completely dismiss that it was just a victim of changing tastes the timing suggests that the problem most likely came from another source. 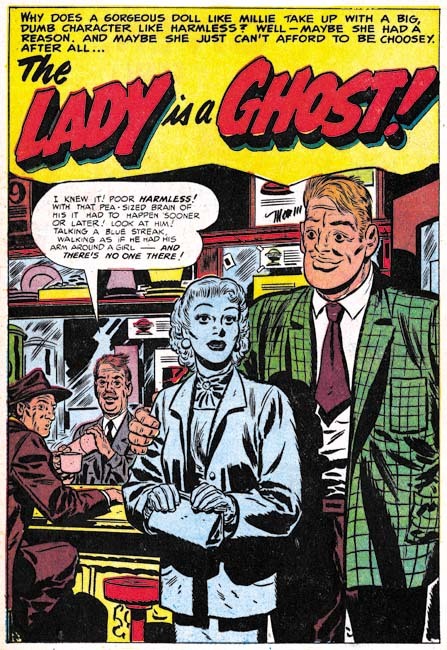 This was the time there was a decline in comics across the board initiated largely by Dr. Wertham (The Real Reason for the Decline of Comics). 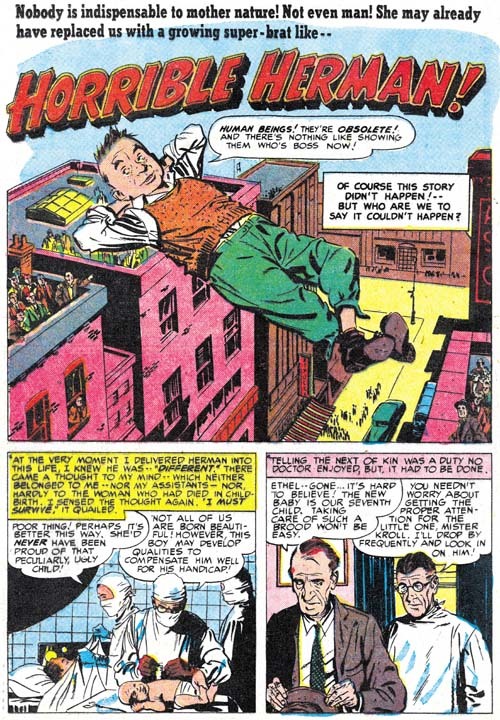 While Dr. Wertham condemned pretty much all comics, he and other critics were particularly negative about the crime and horror genre. 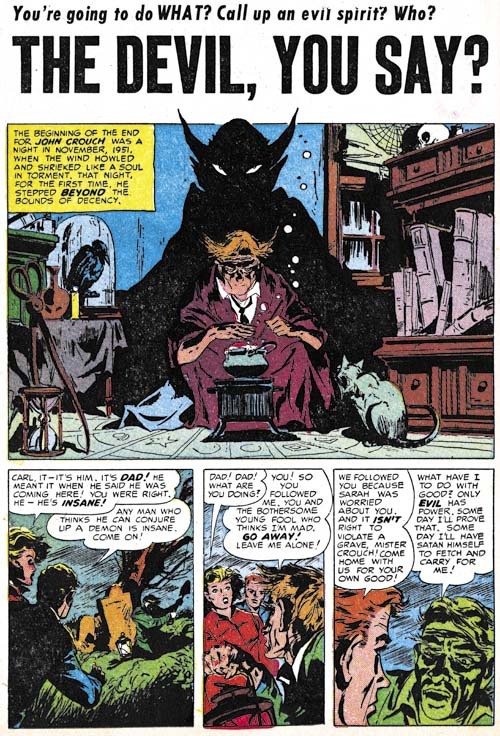 While in reality the contents of Black Magic were mild compared to those horror comics released by other publishers, at that time critics were not too discerning; the title alone made Black Magic a target. 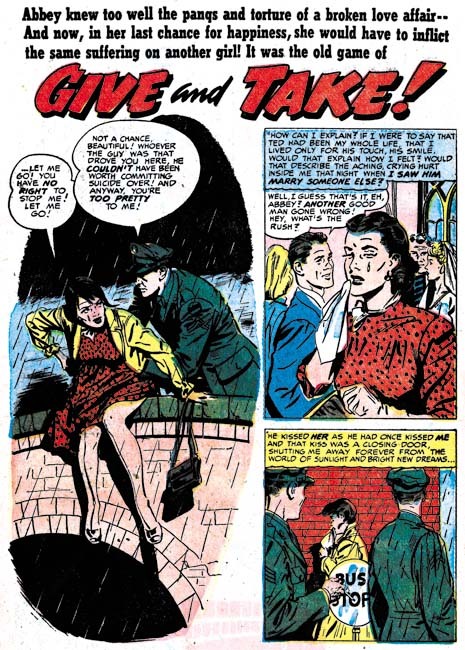 The rising public criticism influenced many newsstands to stop selling some of the more objectionable titles. 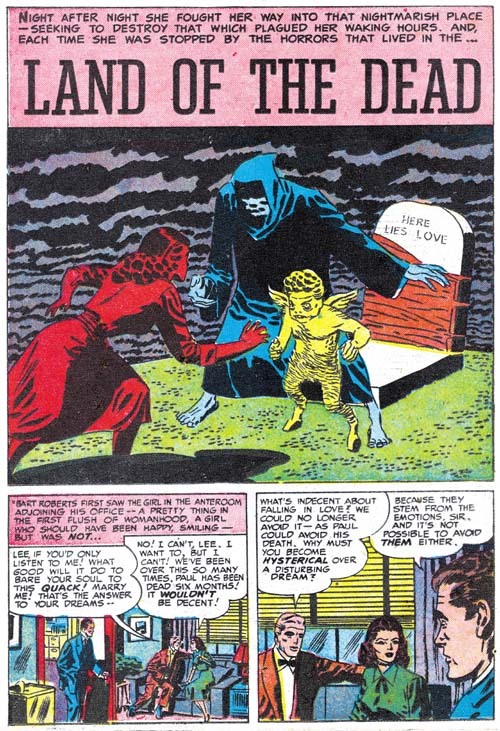 Black Magic would return in a few years and perhaps I will someday post about the second run. 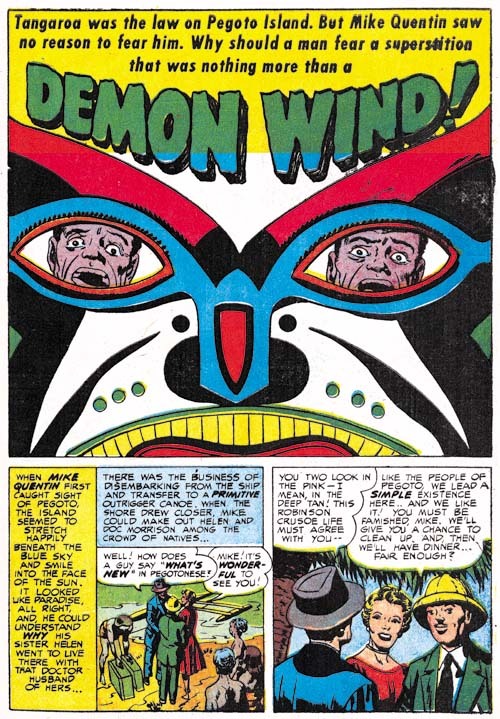 Except for a single story by Steve Ditko, none of the better artists involved with the first run of Black Magic returned for the second one. 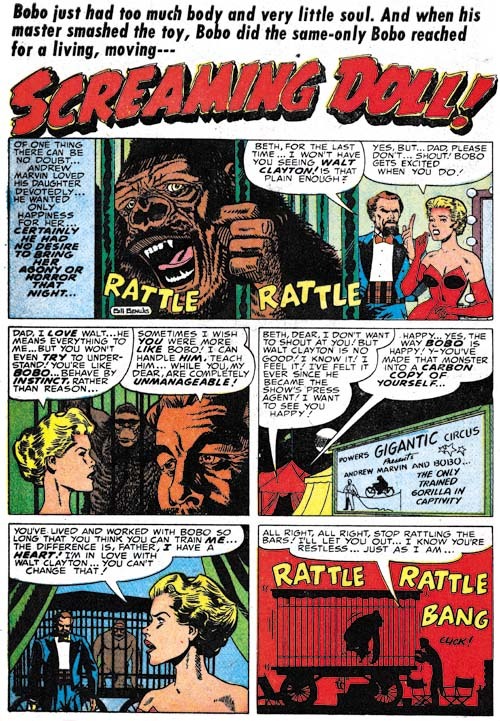 Joe Simon would be the editor of the reincarnated title but he has described it as being done on the cheap. As a business model this might have been a smart approach but it did result in a serious decline in quality. 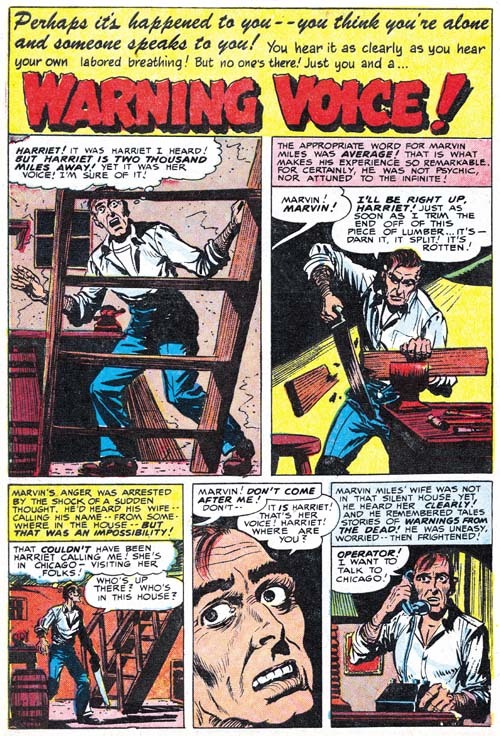 Most fans of horror comics cite the EC titles as the best of the genre. 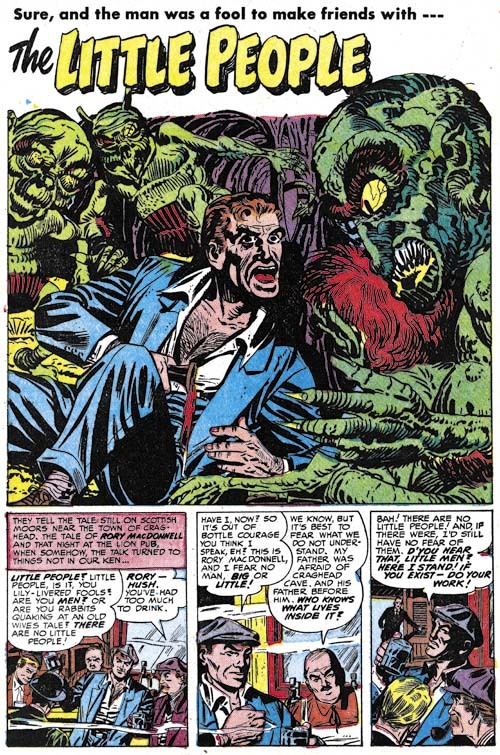 That may be a true assessment if gruesome art is what is desired, but if the reader wants more tasteful art and more interesting stories than the Simon and Kirby Black Magic cannot be beat.